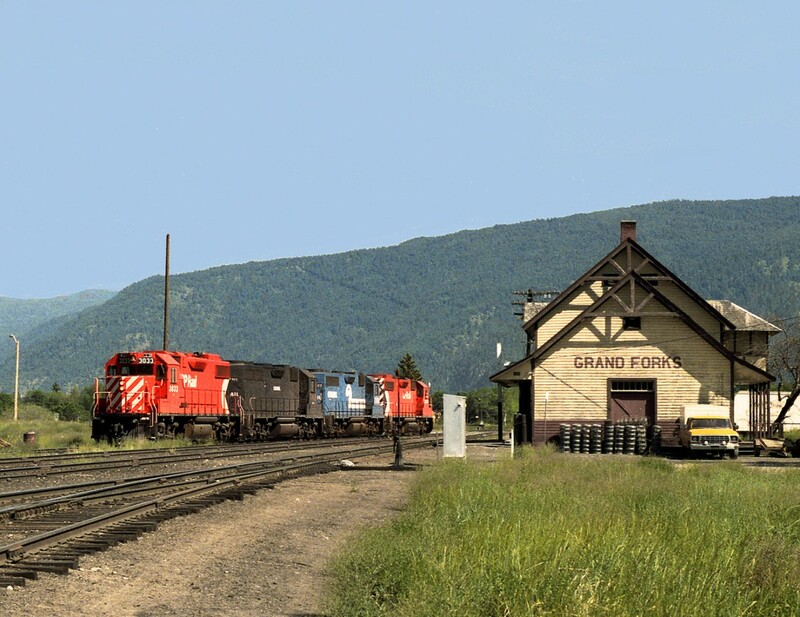 Railpictures.ca - Bill Hooper Photo: Power off CP Boundary Subdivision wayfreight sits by the station at Grand Forks after making a Midway turn. In the morning it will head home to Nelson BC. | Railpictures.ca – Canadian Railway Photography – photographie ferroviaire Canadienne. Caption: Power off CP Boundary Subdivision wayfreight sits by the station at Grand Forks after making a Midway turn. In the morning it will head home to Nelson BC. Congrats Bill on winning Editors Choice with this photo. A fantastic view – also one of the least likely places i’d expect to see Conrail power..! Grew up in Grand Forks and spent many a day watching the crew sort cars in the yard after arriving around 1530hrs from Nelson. It’s nice to see a shot here with the tracks still intact.